Direct referencing of video clips. Reference images in a Wizard help you choose and position your custom effect. In SpiceFX 6, you can select reference still-images directly from video clips on your drive, as shown at left. 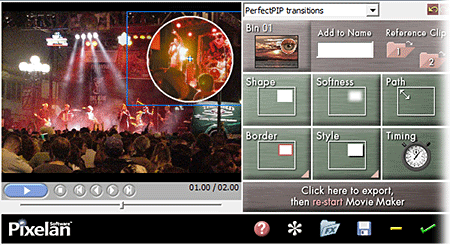 Previously you had to do that via Movie Maker's "Tools > Take Picture from Preview" menu. Now in SpiceFX 6 you can avoid those extra steps! Set duration easier. Just click the indicator under the preview to set the preview's duration, to match the intended duration in the Movie Maker timeline. Improved help. More visuals and tips are now in the attached step-by-step Help panel for each Wizard. Nice! Copy/paste Bins. 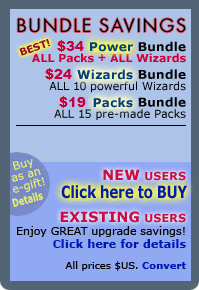 Right-click a Bin to copy/paste its effect to another Bin in the Wizard. Great to organize Wizard effects and experiment with variations! • All keyframes appear. Each is labeled (i.e. "Start" "1" "2", etc.) in the image AND the keyframe line. It is much easier now to know which keyframe you are adjusting. • Improved keyframe matching. 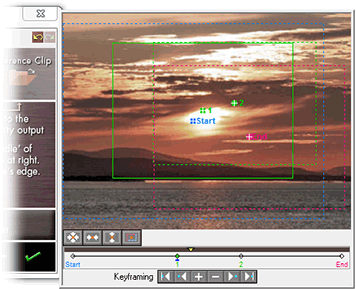 Match the selected keyframe's size/position to the prior or next keyframe. This is handy to hold and/or zoom during the motion path. • Precise keyframe positioning. Right-click a keyframe's frame to set its coordinates and size numerically, if desired. This makes it easier to match effects in other clips. Flicker removal & improved sub-pixel rendering. Tuned algorithms for motion and zooms of pan zooms reduce flicker and moire when applied to high-res photographs and huge panoramas. 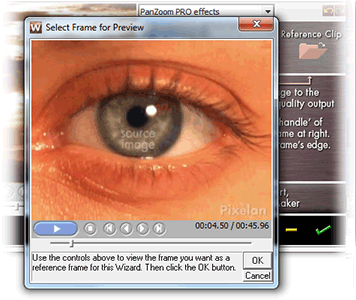 The PanZoom Wizard has -- by far -- the cleanest output of any Movie Maker tool! Watch our example movie to see. In SpiceFX 6, you can now add a drop shadow behind your title text. The shadow can be from 25% to 100% in opacity, and thus are more attractive and useful than Movie Maker's drop shadow which is only shown in certain built-in title animations. Set the fade type for any title animation now in version 6. Choose from fade in/out, fade in only, fade out only, or no fade. 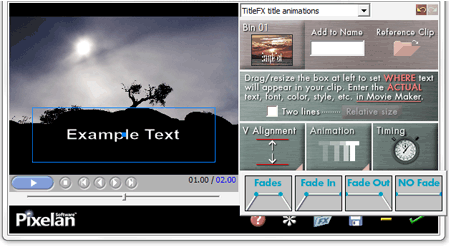 These choices give you editing flexibility with your TitleFX titles. 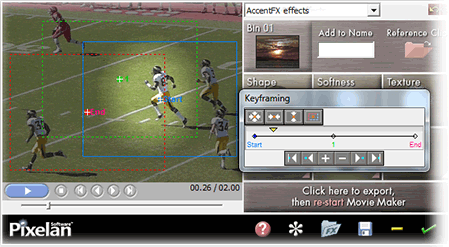 In SpiceFX 6, you can more easily create complex motion paths for accents in the AccentFX Wizard, such as a highlight following a football player in action. Our improved keyframing interface adds labeled keyframes and a more powerful match menu to precisely hold and/or zoom the highlight. Handy additional frame, elliptical and oval shapes are now in version 6, plus one-sided shapes to quickly create lower-thirds backdrops for titles, etc. In SpiceFX 6, you can reverse the flow/direction of the picture in picture transition, giving you greater editing flexibility. Now the Picture in picture clip can fly in either direction along the chosen path. Handy additional frame, elliptical and oval shapes are in version 6, doubling the available picture in picture shapes available to you. • 100+ undo/redo steps -- great for experimenting!